« It’s Advent Calendar Fun Time Again! This was a fairly traditional Father Christmas experience I guess, but as I said we had a second option available to us. We often used to visit the next nearest (and far bigger) town to us for shopping trips with our parent, and this town always had a really impressive Santa’s Grotto in the main shopping centre. So impressive was the Grotto here that there was always a massive queue you had to endure first. They tried to make it as interesting as possible though with the queue winding through a fake snowy landscape complete with polar bears and penguins (despite the fact that this is quite obviously a nonsense proposition due to them living at opposite poles of the Earth). The Grotto itself was a proper looking log cabin affair (I’m sure it wasn’t actually made of logs though), and once inside you got to sit on Father Christmas’ knee and do the usual ritual. Then somebody (probably dressed as an elf) took your picture, which if I remember correctly you could come back and collect later that day – it may even have been included in the price. You said your goodbyes to Santa and upon leaving were handing a bag containing your gift and a few other novelties such as a badge and balloon. The best thing though was the card for extra presents! In what was a smart marketing move on the part of the shopping centre, this card had the names of around eight of the shops in the centre printed on it. You could then visit each shop in turn to be given another little present of some sort, meaning that by the end of your traipse around the shops you came away with quite a good haul of little gifts. As you get older it becomes very easy to remember things as being a lot better when you were younger, when perhaps they weren’t, but I feel in this instance our old visits to the Grotto at the Christmas were far superior to the kind of offerings most shopping centres and department stores offer – if indeed they offer anything at all that is! 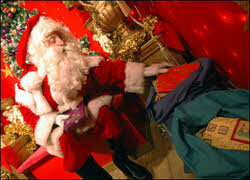 Does anyone have any interesting stories of past visits to see Father Christmas to share with us all? This entry is filed under Memories	and was posted on December 5th, 2011. You can follow any responses to this entry through the RSS 2.0 feed. You can leave a response, or trackback from your own site.